I don’t know about you, but ice cream makes me incredibly happy. When the weather heats up and you’re hankering for something sweet, nothing satisfies like good, old-fashioned ice cream. It’s like stepping back into your childhood, when hot summer days were carefree and you had nothing better to do than sit on the front stoop of your house and lick at a frosty cone. Oh, those were the days. Mind you, those were also the days when I used to consume too many carbohydrates. I was a scrawny little kid and a slender adult but after being diagnosed with pre-diabetes, I know the carb-heavy foods of my youth were at least partly to blame. 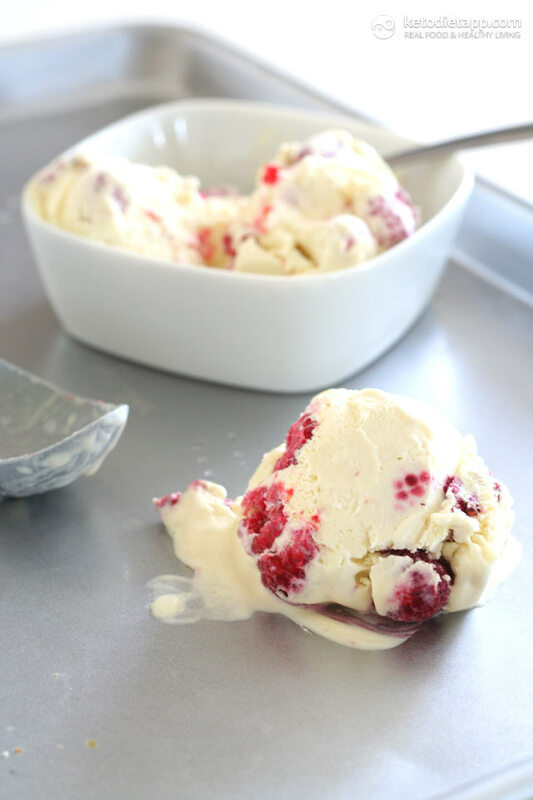 Thank goodness it’s so easy to make ice cream into a low carb treat. And I have a lot of fun on my blog, All Day I Dream About Food, creating different flavours of low carb ice cream. White chocolate isn’t typically low carb, but I’ve discovered that I can get that white chocolate flavour in low carb goodies with some cocoa butter and some vanilla (which, besides sugar, is practically all white chocolate is!). So many thanks to Martina for asking me to guest post. It gave me the excuse I needed to play around with adding cocoa butter to my ice cream base. My family adored this ice cream, and I hope you do too. Check out my ice cream and other low carb recipes at All Day I Dream About Food. KetoDiet note: If you are strictly paleo / primal, you can use 2 tbsp of grass-fed gelatin mixed with 1/4 cup water instead of the xanthan gum. For those who are dairy-intolerant I&apos;d recommend coconut milk such as Aroy-D instead of the cream. Set a large bowl over an ice bath and set aside. Combine cream, almond milk and sweetener in medium saucepan over medium heat. Stir until sweetener dissolves and mixture reaches 175F on an instant read thermometer. Cook until mixture reaches 180F on an instant read thermometer. Remove from heat and add chopped cocoa butter. Let stand one minute to melt, then whisk to combine. Sprinkle mixture with xanthan gum and whisk vigorously to combine. Stir in vodka, if using, and stir in vanilla and stevia extract to combine. Pour mixture into the canister of an ice cream maker and churn according to manufacturer’s directions. 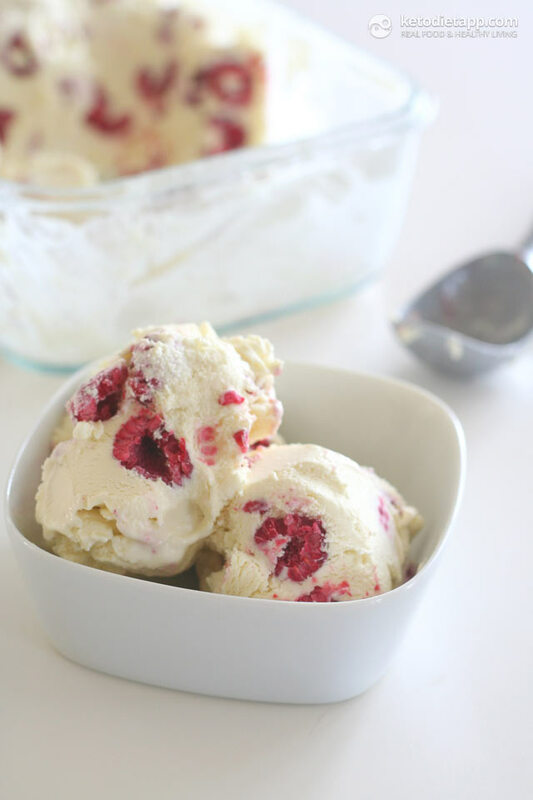 Transfer half of the churned ice cream to an airtight container and swirl in half of the frozen raspberries. Transfer remaining mixture to the container and swirl in remaining berries. Cover tightly and freeze until firm but not rock hard, about 1 hour. Note: for truly scoopable ice cream, you can add 2 tbsp of vegetable glycerin along with the vanilla and stevia extracts. However, it is unclear how many carbs this would add. Vegetable glycerin is a sugar alcohol that many say does not affect blood sugar, much like erythritol. I cannot find a good source on the carb count or its affect on blood sugar. I use it sparingly but find it does help ice cream stay soft, even after hours in the freezer. I think that the vodka will certainly add a nice touch to this recipe which alone is such a great treat even when the temperatures are low! I made this today and just placed it in the freezer (for 1 hour). But I tasted it prior, and it is extremely creamy, sweet, and delicious!! Thank you so much for the recipe!!! Hi Amber, yes, I think you can use any spirits - it will only affect the taste. Vodka is generally better because it's neutral. I think that if you whip the cream, you may add some air and lightless to it but it may still be too dense and freeze too hard. Hi Veronica, no, the stevia will only sweeten it up. I usually use a splash of vanilla extract (alcohol-based) and gelatine to make the ice-cream soft and creamy. I'm just curious how you got the calorie totals. 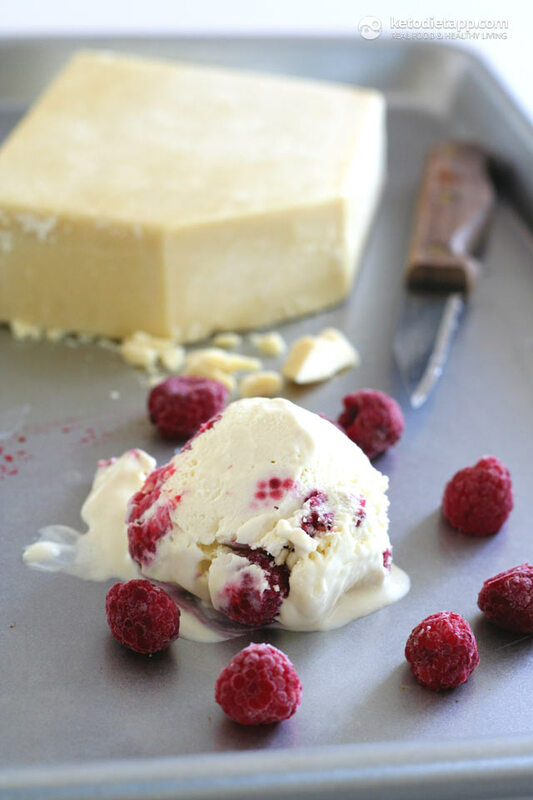 I love white chocolate raspberry ice cream, but my calculations on just the heavy cream leaves it being nearly 257 calories per serving without ever adding the other ingredients. To clarify I googled several sites for the calorie count on a cup of heavy cream which is about 820 times the 2.5 cups. I then divided that by the stated 8 servings. The cocoa butter adds 45 calories per serving. That's over 300 calories just for 2 ingredients! I would love to make this I just don't understand the caloric amounts posted on this. Hi Ali, this is Carolyn's recipe and I'm not sure which database she has been using to get the macros. I just used the KetoDiet app which mainly counts with the USDA database and it all came to: 4.1 g net carbs, 5.1 g protein, 36.6 g fat and 382 kcal in one serving. On the other hand, maybe Carolyn used cream with less fat because I'm counting with 40% fat cream. Hope this helps! Hey! thank you for a great recipe, I have made this today and the ice cream just wont harden on my machine even after 30 minutes, it took really long time to get it not runny (usually its 15 min) do you think its due to the vegetable glycerin? No, the vegetable glycerin wouldn't keep it runny, I don't think - not in that small amount. Do you have the type of ice cream maker with a frozen canister? Did you make sure to freeze the canister overnight and chill the custard for a few hours? The only time I've ever ended up with a mixture that won't churn properly is when my canister wasn't properly frozen. Most of them need at least 12 hours in a freezer before you can make the ice cream. This is the same ice cream base I use for all of my ice creams and I've never had that issue. I have the basic Cuisinart ice cream maker. Thanks for sharing your recipe! My son (8) has started the LGIT diet for epilepsy and doesn't want to feel left out of the fun with his siblings. I am making this recipe now and wonder if you could explain the importance of chilling the mixture for the 3 hours before transferring it to the ice cream maker? I have a lot to learn so thank you for your patience! Just want to see if I could place the mixture directly into the ice cream maker or it must be chilled. I did not add the cocoa butter as I didn't have any. You really do need to chill the mixture before adding it to an ice cream maker. Ice cream makers rely on a frozen canister and if you add the warm ingredients, that will raise the temperature of the canister so that it may never get the custard to chill enough and churn properly. Looks delicious!! Where do I find cocoa butter?